“Midnight City” was not the finest hour for the heroes of Arrow. Brick may not have the aldermen anymore, but with the mayor buckling under the threat of more of Starling City’s politicians being killed, he now has full control of the Glades. Team Arrow may have Laurel on its side as the new Black Canary, but it’s going to take all they’ve got and then some to defeat this madman. In another part of the world, Oliver is revived, but nowhere near 100%. Despite surviving the League of Assassins, it’s hard to believe that he’ll be putting on the mask and returning soon to fight as The Arrow. Things aren’t looking good for our protagonists. Next week, Arrow’s unofficial trilogy concludes with “Uprising,” and judging from the CW’s official episode description and the 30-second promo, it’s going to be a wild ride. Going off all the clues released so far, here is what you can expect from the February 4 episode. Still operating without Oliver (Stephen Amell) and desperate to stop Brick (guest star Vinnie Jones), Team Arrow is forced to consider Malcolm’s (John Barrowman) offer to help shut Brick down as Malcolm has a personal score to settle with the felon. With their leader assumed dead and The Glades under Brick’s control, these are tough times for Team Arrow, which is why they’ll have to decide whether they can accept Malcolm Merlyn’s help. Although he is their enemy and has committed numerous atrocities, desperate times call for desperate measures. The big concern is what Malcolm’s history is with Brick. Could it have something to do with the Undertaking? After all, Brick’s name was listed in Oliver’s notebook from Season 1 as one of many who had “ruined” Starling City. Perhaps Brick somehow interfered with Malcolm’s plan, which worked out since he now controls the Glades (for now). Roy (Colton Haynes) and Laurel (Katie Cassidy) point out that the team could use some help to save the innocents of The Glades, but Felicity (Emily Bett Rickards) is adamantly against it. They look to Diggle to make the final decision. With Brick’s army severely outnumbering them, Team Arrow could use all the help they can get. Roy and Laurel seem to be in favor of Malcolm assisting them. 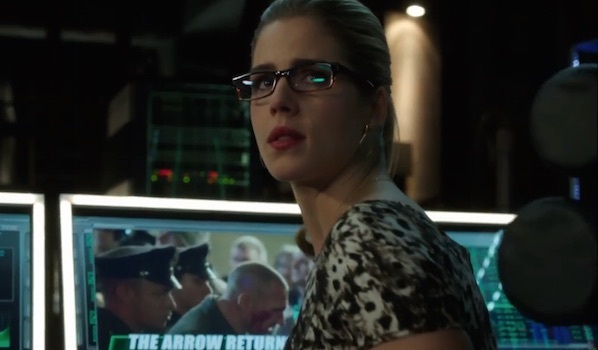 However, Felicity knows what Malcolm is capable of and understandably doesn’t trust him. Diggle has somewhat become the interim leader in Oliver’s absence, so it will be up to him to decide whether they accept help from the guy who ironically destroyed a large portion of the Glades nearly two years before. 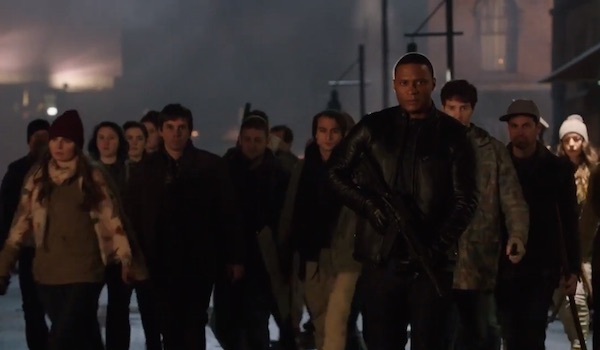 Even if he says no to Malcolm’s offer, the team is still going to get help from an unusual source.The 30-second clip showed Diggle leading a large group of The Glade’s inhabitants, presumably being called into action to help take back their home. 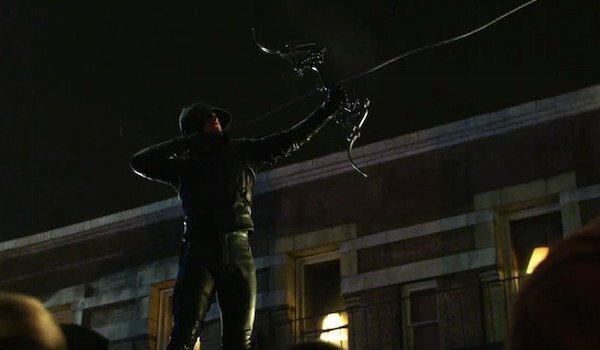 This next Arrow episode is going to be quite reminiscent of The Dark Knight Rises. Sin appeared on and off during Season 2 to hang out with Roy, Thea and Sara, but she hasn’t been seen at all this season. That changes next week, although the circumstances of her return are unknown. If she’s living in The Glades during Brick’s siege, it’s possible Roy may sneak in to ask for her assistance in recruiting others to help them fight Brick and his men. Executive producer Andrew Kreisberg also mentioned last November that she would play a “pivotal role” in the investigation of Sara Lance’s murder, so the street-smart youth will definitely have a lot to do next week and possibly in the following weeks. Meanwhile, the flashbacks chronicle Malcolm’s descent from kind-hearted father and husband to cold-blooded killer after the murder of his wife. 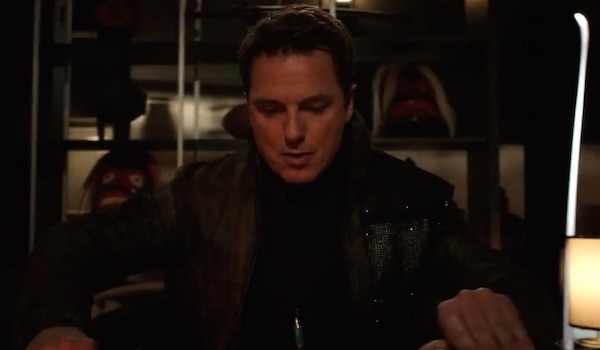 Dialogue from Seasons 1 and 2 revealed that after Malcolm’s wife was murdered in the Glades, he traveled to Nanda Parbat to train with the League of Assassins. These flashback will give us more insight into his frame of mind after her death and what caused him to leave his son behind and learn how to fight from ninjas in the East. These flashbacks won’t excuse any of his crimes, but whether it’s a protagonist or antagonist, it’s always nice to get more information on why a person has taken certain actions in their life. Despite being revived by Tatsu, Oliver was worse for wear in “Midnight City,” and certainly didn’t look like he was ready to don the green hood and bow anytime soon. However, with his city under attack and his team in trouble, it looks like Oliver will pick himself back up and return to Starling City to defeat Brick and instill order. His presence should also help with inspiring the Glades’ citizens to rise up. However, it will take more than brute force to take down Brick. As Tatsu says in the preview, “To defeat this man, you must think like him. Be like him.” Considering that Oliver was at death’s door and Brick is so strong that he can power through getting shot, this is not going to be an easy battle. If you want to check out the "Uprising" preview, it's available in full below.